Comindware is an innovative software company with offices in Boston, Mass. and Munich, Germany. CEO Max Tsypliaev previously founded Acronis, a cloud storage company, where he came to understand the unique needs of business software users. 1. Automated priority-based planning- Once a project is created, Comindware Project creates a plan automatically, ridding managers of unproductive manual task scheduling. Once a manager has used the drag-and-drop user interface to define priorities and establish major tasks, Comindware Project fills in the gaps. 2. 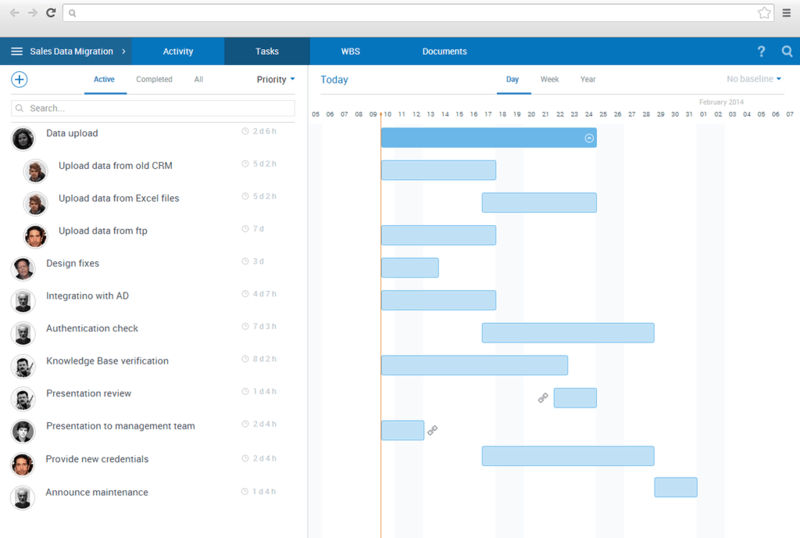 Predictive project planning- Comindware Project includes an interactive, real-time Gantt chart that makes it easy to stay on track and on top of your projects’ status. Any work delayed is automatically rescheduled to the future with the automated, priority-based planning, showing REAL milestone and deadline information, in addition to the target dates. Of course, in addition to these unique abilities, Comindware Project offers all the usual project management software functionality, including time tracking, document management, resource management, a visual work breakdown structure, calendars, strong reporting capabilities, and much more. Comindware Project is pre-integrated with Microsoft Outlook. It allows team members to manage their activities, timesheets and documents directly from software with which your team is already familiar. Comindware Project can be also integrated with a number of systems utilizing its open API. Maximize your project productivity even while out of the office thanks to Comindware Project’s native iPhone, Android, and iPad apps. Available either on-premise or delivered via the cloud, Comindware Project has a flexible per-user pricing structure with multiple tiers based on the total number of users. Learn everything you need to know about Comindware Project. Our experts will reach out to you shortly.